I am blessed to have wonderfully fulfilling consulting, coaching, and training work that also provides me with the opportunity to travel and meet with people from diverse communities across Canada. I’ve learned that despite the diversity and decidedly different assets among the communities, even the small ones like Iqaluit in Nunavut have much in common with larger communities such as London, Ontario or Richmond, BC. Regardless of their size, location and unique assets, many communities are struggling to address the same complex issues. Not only are they being challenged to tackle both new and emerging challenges, they are also searching to find ways to do more with less and do it while maintaining high quality and faster results. It reminds me of those entertainers who spin plates balanced on the tips of poles and then run back and forth to make sure they are all spinning at the same time. Unfortunately some of those plates crash despite all that energy. Today community leaders are juggling their own spinning plates—addressing rising health care costs, shifting economies, a growing divide between the “have’s” and the “have not’s”, an increase in diseases related to inactivity, the need to balance bottom line financial results with the outcomes required for “public good”, aging facilities and infrastructure, and more. Yet, while the challenges may be the same, the responses from the communities are not. While some communities stay stuck with their heads in the sand, others have risen to the challenges with some wonderfully innovative responses. To combat growing obesity, one tiny community organized their own version of the television show, “The Biggest Loser”. To foster both physical activity and safety, others have implemented “Walking School Buses” where parent and caregiver volunteers meet and supervise students on the walk to and from school. Another community now has doctors who promote well-being by writing out a prescription for exercise that includes a pass to the local leisure centre. In another, citizens purchased shares in a cooperative that provides capital for investing in the start up and expansion of local businesses. Another town has incorporated a state-of-the-art indoor running track within the seating of a newly built arena. With a population of only 15,000, they’ve also managed to include skyboxes that were sold out to corporations before the arena opened. Within the same building, they have added a fitness centre, swimming pool, and co-located with a university in order to provide a kinesiology lab, fitness testing, physiotherapy and a host of others services in order to truly become a centre for well-being. Another community struggled with what to do with a perfectly good arena in the wrong location. They knew that accessibility would be increased if a new one could be grouped with all of the other recreation facilities at a different location. The clever solution was to renovate the existing arena to become the new city hall and library. Skylights were added and many of the exposed ducts and struts were painted in colourful hues. The reception area is bright and open with offices added around the perimeter. The resulting ambience is quite wonderful. But why is it that some communities are successful in generating innovative solutions while others get stuck? According to the late American business guru, Peter F. Drucker, innovation is “change which creates a new dimension of performance”. Instead of thinking about innovation as a specific event or product, these communities have understood, as Drucker preached, that innovation is more about an integrative process for solving complex problems. They’ve learned the process of innovation is enhanced through social exchange, and a collaborative, agile, and ongoing community development process that explores assets, challenges, and opportunities—ultimately getting them to the place ”where need meets opportunity”. 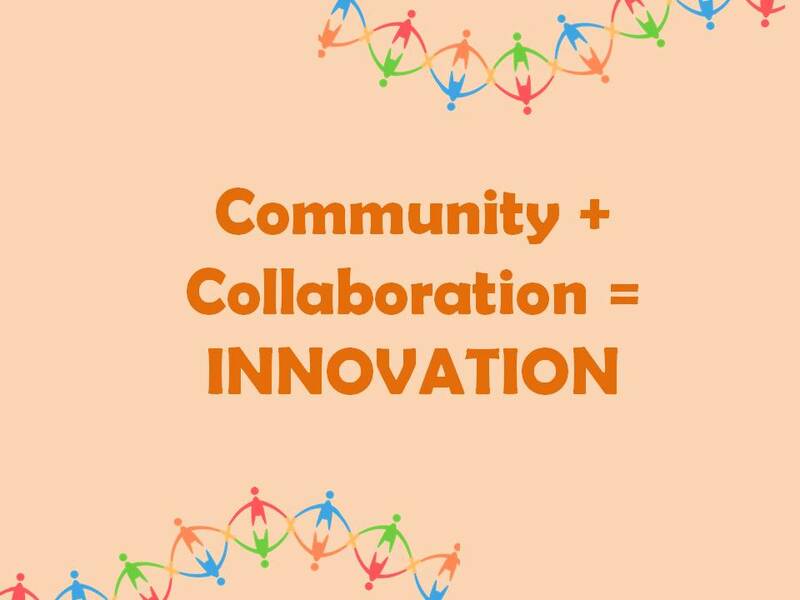 Collaboration seems to be the DNA or critical element required for improving innovation and ultimately performance. When a number of partners and/or sectors are involved and bring their diverse lenses to generating solutions, innovative responses are a typical result. Turns out, the old adage is true, “many heads are better than one” and collaboration and partnerships just might be the missing piece of a very complex puzzle. Next entry: Vice President of Photocopying?